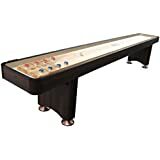 Finding the best shuffleboard table for your home takes some research. 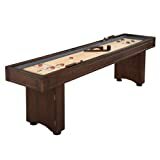 There are many different styles and sizes of shuffleboard tables available to accommodate any size game room your home hosts. Frames also come in multiple varieties allowing for the table to match other furniture in your home. Extensive choices in finishes and extra features round out much of the list of options you will encounter when purchasing a table. There are many choices in the materials used to build each shuffleboard. Explore the type of wood and finish before making a purchase. 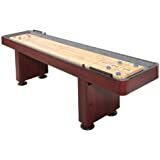 Each option will change the price of the shuffleboard table in addition to the appearance. A solid hardwood playing surface is the best choice because it is studier. Shuffleboard tables need to stay free of dents, dings, and other accidental damage to allow the puck to glide smoothly. Regardless of the wood used the thickness of the plank should be about 3 inches. This 3-inch measurement includes the finish layered on the wood. (source) Shuffleboard finishes can affect the game surface. Take time to weigh the pros and cons of the different wood finishes when choosing a shuffleboard table. Older tables, made with harder woods use shellac or lacquer to cover the playing surface. These materials are added in a thin layer which means the table requires re-coating more often than those coated with epoxy and polyurethane synthetic polymers. Harder woods can absorb harder hits without dents and dings developing. “Both epoxy and polyurethane finishes harden to form an extremely durable surface. Because these finishes are so protective of the woods they cover, their use has enabled modern-day shuffleboard tables to be produced from softwoods.” (source) The newer polymers durability also means that refinishing doesn’t need to happen as frequently. A softer wood reduces the cost of the overall shuffleboard table in most cases. 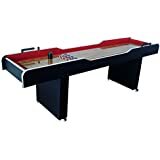 Tournament or regulation sized tables are 22 feet long by 20 inches wide. The cradle around the game surface adds inches making the most common width of the shuffleboard table 31 inches. Since your room measurements need to include at least 2 feet around the table for players to move, having a tournament sized table requires a game room at minimum 26 feet long by about 8 feet wide in size. Shuffleboard tables lengths range from 8-22 feet depending on the manufacturer. Manufacturing of shuffleboards vary. Traditionally the game board is a butcher block of wood pieces glued together that measures 20 inches wide. “Sometimes manufacturers will reduce the width of individual planks to keep costs down. These tables are comprised of 15-16” wide planks.” (source) This may also reduce the width a few inches. It’s also important to remember that the shuffleboard table top comes in one piece. Take note of the angles, hallways, and entryways the table will go through to enter the game room. A narrow space may need a table with removable legs. 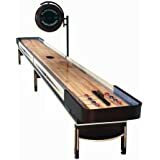 Once you have settled on the size of your shuffleboard table and the materials of the playing surface, there are additional details to consider. Wood expands and shrinks depending on the calendar season and humidity in the air. This varies by location, but humidity is always a factor with wood. As the shuffleboard table swells or shrinks in size, it may develop bowing. Climate adjusters allow you to adjust how convex or concave your playing surface stays. (source) They can also be used to create a slightly concave board to the preference of competitors. Standard shuffleboard table scoring includes lines 1, 2, and 3 but “some customers enjoy adding small ‘bonus 5’ scoring squares at the corners of the shuffleboard playing field” (source) Another choice for scoring is the triangular scoring grid, typically used on outdoor shuffleboard tables. The triangle scoring grid has six different scoring sections. To keep track of the score, you can choose a digital counter or a classic abacus scorer. Sets of score beads mount on the side of your table. Color-coordination allows players to see when a competitor earns point milestones points 10, 15, or 21. Digital counters automate scorekeeping. Some manufacturers have gotten creative with additional features available for shuffleboard tables. You may want to add a custom logo, add weatherproofing for an indoor/outdoor table, or have removable bumpers. 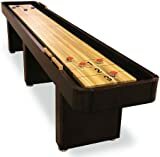 Shuffleboard.net offers additional, unique customization options like glow-in-the-dark playing surfaces, and two-piece playing surfaces held together by dowels for narrow hallways in homes. If you aren’t interested in a glow-in-the-dark table, you can consider a table light which attaches to the side of the table. Playing shuffleboard requires pucks which are also called weights. “High-quality pucks feature plastic topped caps, heavy chrome plated steel and offer good balance for feel and playing control.” They are available in two different sizes: medium and regulation. Regulation pucks are 2 5/16 inches in diameter and are used on large tables 14 to 22 foot long for tournament play. Miniature sets of bowling pins are sold explicitly for shuffleboard tables. 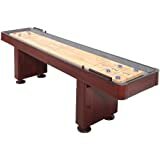 These pin sets offer a second option for the use of the shuffleboard table. Shuffleboard wax has several names, but all are created to do the same thing. Other names for shuffleboard table wax are shuffleboard sand or shuffleboard powder. By any name, it is considered an essential part of indoor shuffleboard competition. Tiny silicone beads and ground corn make up the shuffleboard wax. The goal is the help the puck glide smoothly and quickly from one end of the table to the other. “There are many different types of wax available, and it is important to get the right kind for your table length and expertise level. Slower waxes allow for more friction, and thus make the puck glide slower. This is ideal for small tables and inexperienced players. Faster waxes are good for long tables and professional play, as it requires more skill. 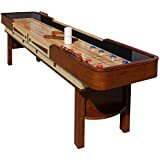 Fast waxes are NOT recommended for short tables.” (source) Shuffleboard wax is sprinkled on the table before a game begins. It may take experimentation to figure out the type of wax and the best amount for use on your table. 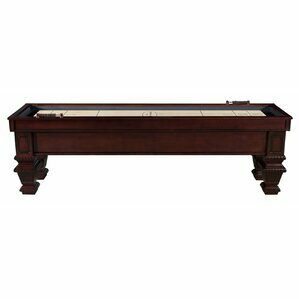 Shuffleboard table details vary extensively, but the game is fun wherever you play. It’s worth the time spent before you purchase your table measuring your home, researching wood choices and deciding on customization to have an excellent shuffleboard table your whole family will enjoy for years.